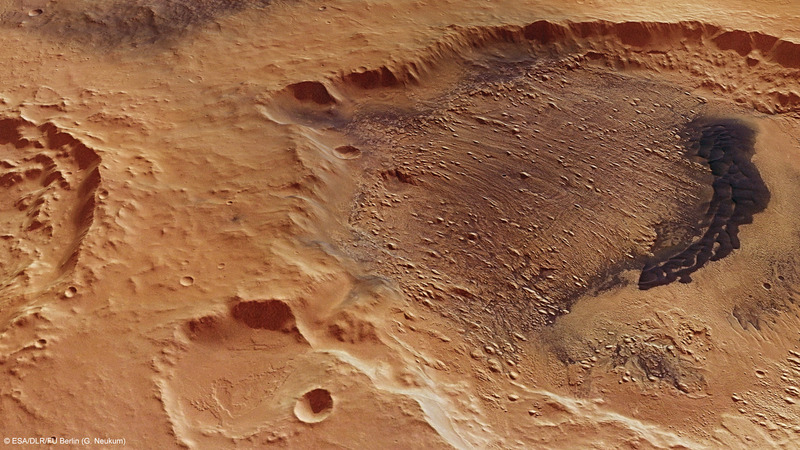 Yardangs in Danielson Crater - indicators of climate changes on Mars? 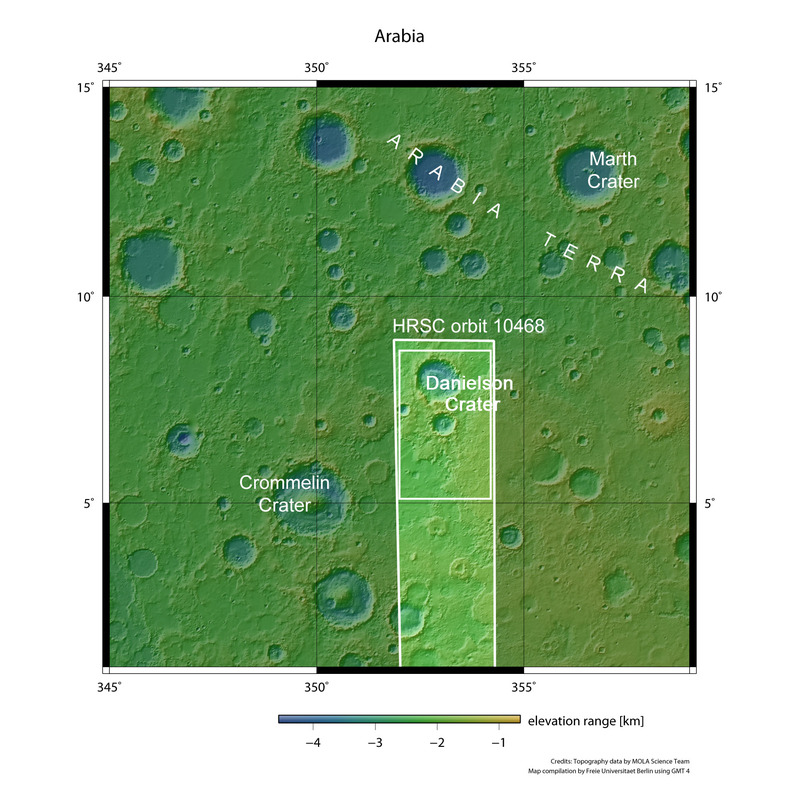 The Arabia Terra region on Mars is populated with numerous craters, filled with deposits of various materials that, over time, have become severely eroded. The latest images acquired by the HRSC camera show many features of this kind, known as 'yardangs', in Danielson Crater; the different types of material these contain could be explained by changes in the climate. 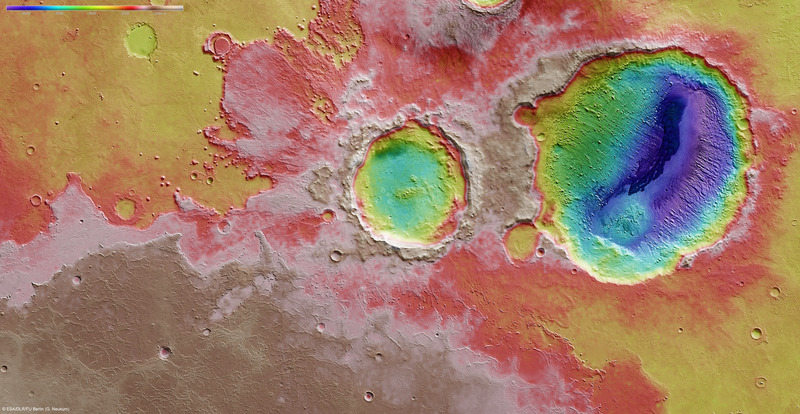 On 19 March 2012, the High Resolution Stereo Camera (HRSC), operated by the German Aerospace Center (Deutsches Zentrum für Luft- und Raumfahrt; DLR) and on board ESA's Mars Express spacecraft, acquired images of two adjacent craters with very different characteristics in the Arabia Terra region. The Danielson Crater (with a diameter of approximately 60 kilometres) is characterised by a variety of features referred to as 'yardangs', while the smaller Kalocsa Crater (with a diameter of approximately 33 kilometres) entirely lacks this kind of formation. This crater's floor is 1000 metres higher in elevation than that of Danielson Crater. Arabia Terra is the transition zone between the southern Martian highlands and the low-lying plains of the planet's northern hemisphere. Similar to many craters in the Arabia Terra region, Danielson Crater is filled with stratified sediments that, over time, have become heavily eroded. The terrain features resulting from this erosion are known as 'yardangs'. Yardangs are rocky protrusions with streamlined shapes that formed as a result of the removal of the softer surrounding material by wind-driven abrasion. The prevailing wind direction during the erosion process can be determined since they are, for the most part, arranged parallel to one another. Yardangs are 'milled' out of the rock by the grains of sand carried by the wind, which have a sandblasting effect. When winds blow in the same direction for an extended period of time, nozzle-like shapes can be formed - wind-blown channels - which accelerate the process. The unusual name originates from the language of the Uigurs and roughly translates as 'steep sand wall'. The Swedish researcher Sven Hedin coined the term in 1903 after observing rock formations of this kind in the Central Asian Lop Nor desert. The yardangs in the Danielson Crater indicate that the wind must have blown primarily from the north-northeast. Researchers suspect that the sediments were initially transported into the crater by the action of the wind; there, they came into contact with water, which caused them to solidify. Later, during a dry period in the history of Mars, these formations were eroded away again. Some researchers have suggested that the changes to the sediments could be an indication of changes in the climate that were triggered by periodic shifts in Mars' rotational axis. The effect of the wind can also be identified in an area of dunes extending over a length of 30 kilometres in Danielson Crater, although these dunes were only formed in the planet's recent geological past. The dark discolouration is probably due to volcanic material - volcanic ash or dark volcanic rock weathered down by sand and dust. This is a stark contrast to the typical ochre-coloured surface of Mars. Impact craters as an indicator of the depth of groundwater reserves? The smaller Kalocsa Crater presents a quite different picture; no stratified sediment deposits can be seen here. This is possibly due to the fact that this crater is not as deep. 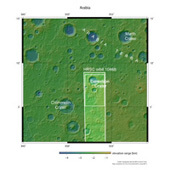 Danielson Crater is about 1000 metres deeper than Kalocsa Crater and might therefore have reached a reserve of ground water located at a greater depth, which could have caused the sediments to solidify. Other striking features are the massive lava flow in the lower section of the image (east of the craters) and a step that marks the transition to a lower-lying area of terrain in the top left-hand section of the image (south-west). 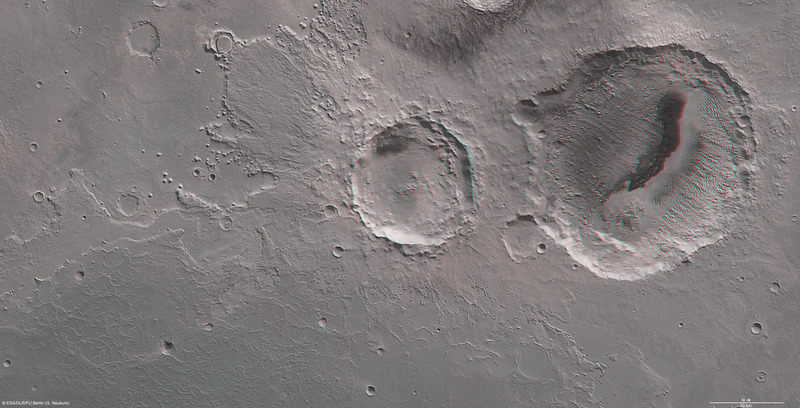 Here, part of the ejecta from the smaller Kalocsa Crater extends like a promontory into the lower-lying surroundings. At the edge of these ejecta, a crater about five kilometres across - which is almost entirely filled - is visible. This suggests that the ejecta blanket once stretched further into the surrounding area. In addition, a number of small, bump-shaped elevations can be identified. These are likely remnants of a terrain that once reached a much higher altitude. These HRSC images were acquired during Mars Express orbit 10468. The image resolution is approximately 26 metres per pixel. The data was acquired at approximately 7 degrees north and 353 degrees east. The HRSC camera experiment on the European Space Agency's Mars Express mission is headed by Principal Investigator (PI) Professor Gerhard Neukum (Freie Universität Berlin), who was also responsible for the technical design of the camera. The science team consists of 40 co-investigators from 33 institutions in ten nations. The camera was developed at DLR under the leadership of the PI and it was built in cooperation with industrial partners EADS Astrium, Lewicki Microelectronic GmbH and Jena-Optronik GmbH. The instrument is operated by the DLR Institute of Planetary Research in Berlin-Adlershof. The systematic processing of the HRSC image data is carried out at DLR. The images shown here were created by the Institute of Geological Sciences at Freie Universität Berlin.